This article contains interesting facts, pictures and information about the life of the Kiowa Native American Indian Tribe of the Great Plains. Summary and Definition: The very name of the Kiowa spread terror. The Kiowa tribe fiercely resisted the white encroachment of the Great Plains and fought in Battle of Adobe Walls against Kit Carson. The names of the most famous chiefs of the Kiowa tribe included Santana (1830-1878), Chief Red Tipi, Chief Little Mountain, Chief Lone Wolf and Chief Kicking Bird. This article contains fast, fun facts and interesting information about the Kiowa Native American Indian tribe. Find answers to questions like where did the Kiowa tribe live, what clothes did they wear, what did they eat and who were the names of their most famous leaders? Discover what happened to the Kiowa tribe with facts about their wars and history. What was the lifestyle and culture of the Kiowa tribe? The Kiowa were a Uto-Aztecan tribe who called themselves the Kwuda, the "Coming-Out People." who moved into Texas from the northeast in the 1700's and formed an alliance with Comanche tribe. The Kiowa were famous for their hunting and warrior culture and their the nomadic lifestyle, living in tepees, on the Great Plains. Warfare was a central part of the Plains Indian culture which led to conflicts with neighboring tribes, the Spanish, the Mexicans and the Americans. They later gained allies with southern bands of the Cheyenne and Arapaho. Scalps of their enemies were taken as trophies in battle and torture and atrocities were used on the battlefield to intimidate and humiliate their enemies. What was the religion and beliefs of the Kiowa tribe? The Kiowa tribe revered the Sun, stars and constellations such as the Pleiades and created tribal records in the form of a pictographic calendar. The power of Kiowa chiefs and military societies was complemented by the spiritual authority of the Taime and medicine bundle priests. The Kiowa worshiped a stone effigy they called the taimay represented as a human figure with robe painted with sun and moon and a headdress of single feathers. The taimay figure was two feet in length and wrapped in ermine skin and adorned with a blue pendant. What were the rituals and ceremonies of the Kiowa tribe? The rituals and ceremonies of the Kiowa tribe and many other Plains Native Indians, included the Vision Quest, the Sweat Lodge ceremony, and the Sun Dance Ceremony. The sacred, ceremonial pipe (called a Calumet), was ritually filled with tobacco was passed among participants at all sacred ceremonies of the Kiowa. The Calumet, was often used to seal a peace treaty, hence the term 'Peace Pipe'. The Calumet was also used to offer prayers in religious ceremonies and in war councils. 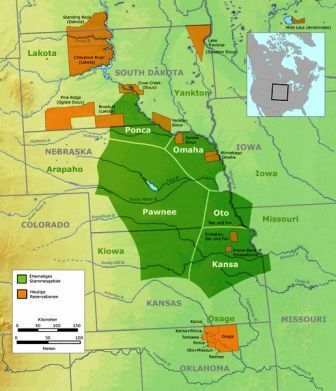 Where did the Kiowa tribe live? The Kiowa are people of the Great Plains Native American cultural group. The location of their tribal homelands are shown on the map. The geography of the region in which they lived dictated the lifestyle and culture of the Kiowa tribe. The clothes worn by the Kiowa men consisted of breechcloths in the summer and fringed buckskin tunics or shirts and leggings in the winter. Warm buffalo robes or cloaks were also worn to protect against the rain and the cold. The Kiowa braves also wore beaded, feathered war bonnets decorated with eagle feathers and beadwork as symbols of accomplishment and bravery. The traditional headdresses of the Kiowa were caps with straight-up eagle feathers and ermine tails trailing behind them. The men wore their hair in two braids. In order to erase their footprints, the Kiowa men attached a fringe or a tail to the heels of their moccasins. Clothes of Kiowa women wear? The type of clothes worn by the women of the Kiowa tribe were knee-length dresses and leggings. The women also wore the buffalo robes to keep warm and dry. Kiowa women wore their hair in two, thick braids decorated with beads. The dresses of the Kiowa women that were used for special occasions were elaborately decorated with beads and painted with signs and symbols. The women of the Kiowa tribe were responsible for making the clothes worn by the people. Most items were sewn from soft, tanned skins of deer (buckskin) and buffalo. Clothes were often decorated with paint, porcupine quills or beadwork. Kiowa clothing for both men and women were adorned with paintings and decked with ornaments, especially necklaces, chokers and earrings. 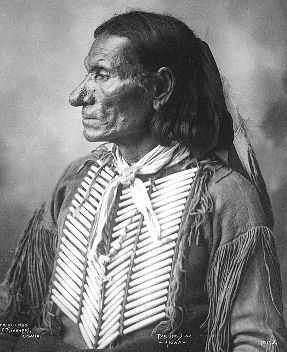 A 'Hair Pipe' is the term used for a long, slim, hollow, cylindrical bead that were used as hair decorations, chokers and the famous breastplates that were worn by many of the Great Plains Indian tribes. Hair pipe breastplates were made by stringing rows of the long beads on buckskin cords to form an elaborate breastplate. What did the Kiowa tribe live in? 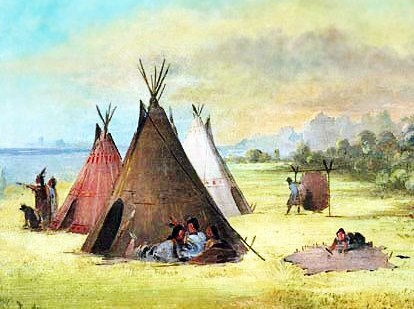 The Kiowa tribe lived in tent-like homes called tepees. The tepees were constructed using long wooden poles that were covered with animal skins such as buffalo hides. The Tepee tent was pyramid shaped, with flaps and openings. The tepee was rounded at the base and tapered to a narrow open smoke hole at the top. Most tepees were approximately 12 to 16 feet in diameter at the base. A hearth was built in the center of the tepee for heating and cooking. The tepee suited the nomadic lifestyle of the Kiowa tribe as it was quick to erect and easy to dismantle. What language did the Kiowa tribe speak? The Kiowa tribe spoke in the Uto-Aztecan language. The Plains tribes spoke in many different languages and used sign language to communicate with each other and Many writers have claimed that it was first created by the Kiowa tribe. What food did the Kiowa tribe eat? The food that the Kiowa tribe ate included the meat from all the animals that were available in their vicinity: Buffalo, deer, elk, bear and wild turkey. The mainstay of their diet was supplemented with roots and wild vegetables such as spinach, prairie turnips and flavored with wild herbs. Wild berries and fruits were also added to the food available to the Kiowa. When animals for food was scarce the tribe ate pemmican, dried buffalo meat. What weapons did the Kiowa use? The weapons used by the Kiowa tribe included bows and arrows, stone ball clubs, jaw bone clubs, hatchet axe, spears, lances and knives. War Shields were used on horseback as a means of defence. The rifle was added to their weapons with the advent of the white traders and settlers. Who were the most famous leaders and chiefs of the Kiowa tribe? The most famous leaders and chiefs of the Kiowa tribe included Santana, Chief Red Tipi, Chief Little Mountain, New Fire, Chief Lone Wolf and Chief Kicking Bird. 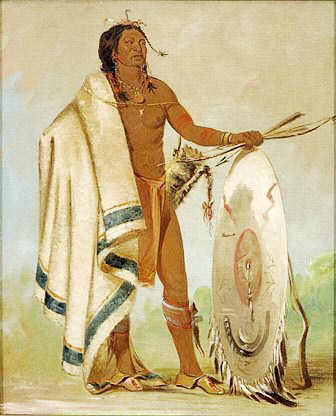 The Kiowa tribe mounted many raids along the Santa Fe Trail over which the wagon trains, stage coaches and the settlers traveled from the Missouri River through southern and central Kansas, up along the Arkansas River and then southwest across the desert for Santa Fe in New Mexico, and the surrounding areas. The following history timeline details facts, dates and famous landmarks and battles fought by the Kiowa Nation. The Kiowa tribe fought on the British side in the War of Independence and in the War of 1812. 1853: Treaty at Fort Atkinson, Kiowa, Comanche and Apache Native Indians in which "...annuity to be given annually in July in the vicinity of Beaver Creek, the government may establish farms for the benefit of the tribes." 1887: The Dawes General Allotment Act led to the break up of the large Indian Reservations and the sale of Indian lands, including Comanche lands to white settlers. For additional facts and information refer to the legend and the Story of the Battle of Adobe Walls. The Kiowa Tribe was one of the most famous tribes of the Great Plains Native American Indians. Discover the vast selection of pictures on the subject of the tribes of Famous Native Americans such as the Kiowa nation. The pictures show the clothing, war paint, weapons and decorations of various Native Indian tribes, such as the Kiowa tribe, that can be used as a really useful educational resource for kids and children of all ages. We hope you enjoy watching the video - just click and play - a great social studies homework resource for kids .